With the pace of modern life, many people can feel the weight of the world on their shoulders. Feeling low, stress and anxiety can wear the body down, making it hard to cope. 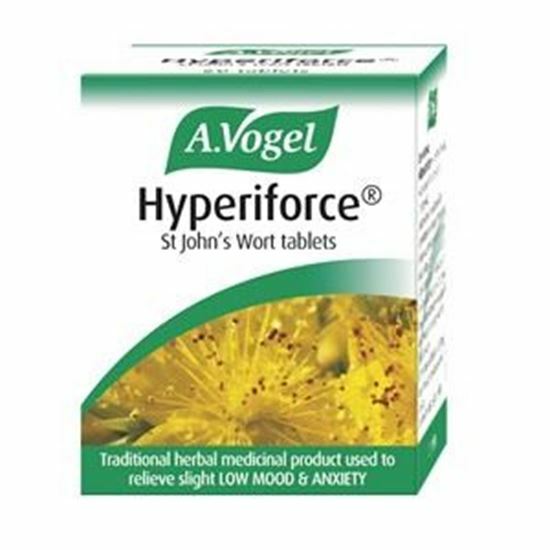 Hyperiforce St John's Wort tablets is a traditional herbal medicinal product used to relieve the symptoms of slightly low mood and mild anxiety, exclusively based on long-standing use as a traditional remedy. Extract of organically grown fresh Hypericum perforatum (St John’s Wort) flower heads. Also contains microcrystalline cellulose, maize starch, soya polysaccharide and hydrated cottonseed oil. Each 275mg tablet contains the equivalent of 1000mg of fresh Hypericum perforatum providing 330mg of hypericin. Adults: 1 tablet 3 times daily. Before taking this product: Please check with your doctor of pharmacist if you are taking any prescribed medicines as St John's Wort may affect the way they work.